On this deluxe food & wine tour of Spain you will explore Galicia´s Rias Baixas (pronounced REE-as BUY-zhas) an exceptionally indented coastline, with creeks and hidden coves at every turn, a scattering of inlets lying close inshore, and an alternating pattern of cliffs and beaches. In this Forgotten Celtic region of Northwestern Spain nature alone is not at play however. There is much to be enjoyed including its famous Albariño wines accompanied by rich local cuisine most notably Seafood. On this tour you will discover the Galicia, Northwestern Spain with all senses... starting off in Santiago de Compostela the Capital of the region and also the end of the important Pilgrimage Way of St. James. Here you will walk the streets of the old quarter and visit the Cathedral which marks the heart of this historic centre. Then you will follow down the Atlantic coast in the area called the Rias Baixas (Low Estuaries or Bays), here you will get a chance to stroll along the ports of small fishing villages and enjoy exclusive visits to various wineries making the highly acclaimed Albarino white wines of the D.O. Rias Baixas. In between winery & cultural sites you will stop to dine in a mix of different types of restaurants while touring, we have selected them to show you the variety of the Galician Cuisine... from Michelin Star Restaurants like Toni Vicente in Santiago to small fishermen´s taverns right on the docks offering an abundance of fresh seafood (Spider Crab, Bay Prawns, Lobster, etc...) caught just that morning and served in handmade wicker baskets right on the table for everyone to dig in and enjoy this delectable finger-food. While on the coast you will get the chance to learn in-depth about the gastronomy by cooking side-by-side with a Galician woman who owns/runs a small Rural Country Manor & Restaurant and knows just about all the traditional coastal cooking secrets of Galicia! For your comfort during the trip we have selected a couple of stays in Paradores (Santiago and Baiona), these accommodations are placed within historic building like Monasteries, Castles, etc... Ranging from 4* to 5* GL (Grand luxury). Then as well you will have a few more rural stays in Galician Pazos, which are Noble Manor Houses with all the amenities of a Parador but on a smaller more personal scale. Come Savor Seafood and Albarino wines of Galicia, Atlantic Spain! - Today you will cook side-by-side with a Galician women who owns/runs a small Rural Country Manor & Restaurant and knows just about all the traditional coastal cooking secrets of Galicia! - You will be shown how to make a 3-course menu based in Fish and Seafood in the fully-equipped kitchen of this country manor. 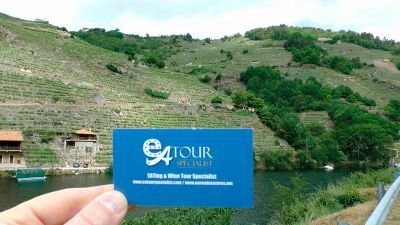 - Visit Sean O`Rourke´s family Artisan wine cellar inside the old ABADIA (ABBEY) DE CABEIRAS that does not sell on a commercial level and conserve the traditional method of producing Albariño & Condado wines in the valley. - Tonight we will stay in a Noble Galician Manor which also has a winery that we will visit. Views from the Manor are spectacular being surrounded by vines and the Mino River below. - (L): 5 Lunches: 2 or 3 course gourmet meals changing the cuisine & wines typical of each region visited. All restaurants are selected for location, service & fine quality. - (D): 5 Dinners 2 or 3 course gourmet meals changing the cuisine & wines typical of each region visited. Most of the dinners are in the hotels where you will be staying overnight. All restaurants are selected for location, service & fine quality. Located in the Tea Valley you will find the recently renovated 17th Century Casa Grande La Almuiña, a Noble Galician Pazo Manor where every corner is enchanting and designed for sitting back and relaxing in a traditional atmosphere overlooking the vineyard with the Miño River and Portugal on the other side as your backdrop. The manor has its own wine cellar making one of the best Albariño wines of this Sub-Zone of the D.O. Rias Baixas.